Last week the team from Pacejet had the opportunity to sponsor and attend NetSuite SuiteWorld, one of the top cloud events for enterprise software. We learned a lot about ongoing successes and challenges for business shippers as we talked with many different customers, prospects, and partners in San Jose. As I reflected on our conversations with businesses in ecommerce, distribution, and manufacturing, three over-arching themes came to mind and I thought I'd share them in today's post. The term "omnichannel" is buzzy, we didn't hear it much by that name from prospects and customers or from partners for the most part. But the shadow cast by Omnichannel pressures loomed large as we talked to attendees about opening multiple locations, dealing with increased shipments to retailers, expanding exports, setting up new private-label supplier arrangements, broadening product lines, etc... Across the range of business types we heard from, almost every company seemed to be wrestling with the fast and furious pace of change in their supply chain. Another topic discussed quite often was efficiency from the perspective of being a dependable supplier more so than as a way to purely cut costs. Yes, shippers were interested in lower expenses, but there was an even stronger interest in predictability and reliability. Examples included users very much focused on maintaining high Amazon rankings with a special focus on avoiding any delays in information like tracking numbers integrating back to Amazon. Overall many businesses were on a mission to make sure that if they promised to ship an item same day (for example), that item got out the door on time. Efficiency discussions often started out with a cost issue but sooner or later ended up focusing on reliable and repeatable processes to help grow sales and scale the business. In addition to seeing many long-time users, we also talked with first time cloud software users working through the implications of moving from standalone apps / offline workflows to one integrated cloud platform. Users moving off standalone desktop shipping applications, for example, would ask how they could process shipments independently of ERP fulfillment transactions, almost as-if they expected their new system to operate like their old collection of standalone software apps with batch "interfaces". The idea that new cloud based platforms (like NetSuite and Pacejet) synchronize physical actions like picking, packing, and shipping with system transactions so that everything runs in real-time is easy enough to get your head around conceptually, but dealing with the day to day reality of "my work can't happen until his or her work is done" can be a challenge. The benefits of real-time, cloud-based systems are compelling, it can just take some time for users to get comfortable with integrated, company-wide business processes. 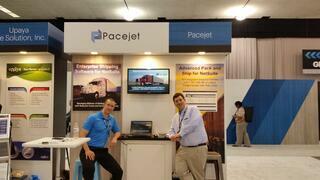 By the end of the week, team Pacejet left SuiteWorld worn-out but impressed and excited. As always the NetSuite agenda and execution were top notch, lots of new product innovations were presented, there were great networking opportunities, and partners were made to feel "part of the family". But it was almost a little remarkable how much the focus of enterprise software has returned to business innovations for omnichannel, fulfillment efficiency, or integrated workflows across the enterprise. Was the cloud important? Yes, but this year it seems like the world of enterprise systems has said "well of course it's the cloud ... now let's get on with running the business better". If you missed us at SuiteWorld or have a thought, we'd love to hear from you.